I am going to be making some cakes for my friends little girls first birthday and although I haven’t said what design I’m going to do I’ve been thinking of some ideas. I know she loves sheep and has a house full of sheep things so I thought these would be a good start to have a play with…I just never expected them to be so popular! Since posting a photo on my Facebook page I had lots of positive comments about them, I surprised a friend at work with a box of 6 and I’ve been asked to make some for a charity coffee morning. Although these do look pretty cute, they are surprisingly easy to make and for the 12 it only took me an hour and a half from baking to decorating. I’m thinking of adapting the design to make a couple of other farm animals – cows and pigs. 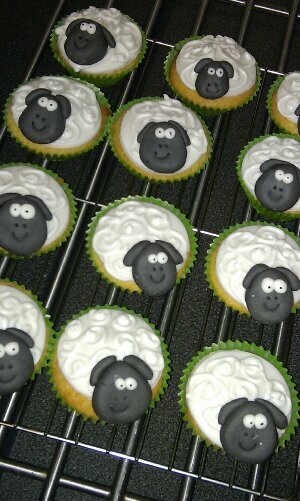 When I get round to making them, I’ll show you my efforts. They look absolutely cute and perfect !